As you lean over your keyboard breathing right now, you are inhaling a mixture of atmospheric gasses consisting primarily of oxygen (21%), nitrogen (78%), and carbon dioxide (0.04%). The total weight of the atmosphere on you is exerting a particular pressure. When you rise in altitude, the amount of atmosphere above you decreases, so the pressure does as well. This pressure is relatively constant depending on your altitude. Each gas present in the atmosphere contributes to this pressure (and the exact contribution depends on the amount of gas present). Thus, nitrogen exerts the greatest amount of pressure, followed by oxygen. At sea level, the pressure exerted by the atmosphere (aptly named “1 atmosphere”) is approximately 760mmHg. Consequently, oxygen constitutes 21% of that pressure (159mmHg), and so on for the other gasses. Once air gets inside the lungs, the composition of the ‘atmosphere’ changes. Since our body is trying to dump carbon dioxide and absorb oxygen, the alveoli will have higher levels of carbon dioxide and lower levels of oxygen. Plus, because the airways are so moist, the humidity of the air will be high, and the gaseous form of water (vapor) will affect the airway pressures. Just like the atmosphere around us, each gas present in the alveoli contributes a partial pressure to the overall pressure. Once the gasses cross the lung and dissolve into the blood, they are now part of another ‘atmosphere’, composed of the total pressure of all the dissolved gasses in the blood. The fact that gas is able to dissolve in water is the reason that fish are able to ‘breathe’ underwater. Their gills are specially adapted to filtering the dissolved oxygen out of the water. It is also the same reason that a SCUBA diver will develop the ‘bends’ if they ascend too quickly after a prolonged dive. Over the course of the dive, nitrogen becomes dissolved into the blood at higher-than-normal levels because the high pressure underwater ‘forces’ the gas into the blood. When that pressure is relieved by a sudden ascent, the gas can no longer remain dissolved at such high concentrations, and it bubbles out of the fluid (like opening a bottle of soda). If carbon dioxide and oxygen are both present in the alveoli, what happens to the oxygen pressures when the carbon dioxide pressures go up? They must go down! After all, we haven’t changed the total pressure of the system, only the partial pressure of oxygen. The pressure of oxygen in the alveoli (PAO2) depends on the amount of oxygen inspired (FiO2), and the pressure of the other gasses present (ie. Water vapor, 47mmHg). Carbon dioxide’s presence in the alveoli depends on how much carbon dioxide is in the blood. Because we are especially good at off-loading carbon dioxide, the pressure in the alveoli can be calculated by multiplying against a factor of 1.2. Thus, if there is too much carbon dioxide in the blood (examples: COPD, obesity hypoventilation syndrome, etc. ), there will be extra carbon dioxide in the alveoli, and there will be less room for oxygen. You are breathing room air at sea level (FiO2 = 21%, Barometric pressure 760mmHg), and you have a normal arterial carbon dioxide level of 40mmHg. Assuming that oxygen is able to freely diffuse from the alveoli to the blood (which might not be true in certain cases of lung disease), the alveolar oxygen pressure would be about equal to the oxygen pressure in the blood. If we correlate this pressure to the oxyhemoglobin dissociation curve, below, we see that this equates to a 98-99% oxygen saturation. Understanding this curve is especially helpful to understanding the significance of your patient’s oxygen saturation. 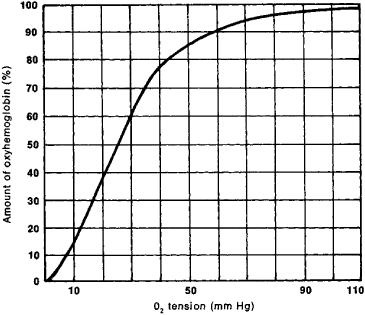 As you can see, at higher pressures of oxygen in the blood, the saturation curve plateaus. To maintain an oxygen saturation between 90% and 100%, you could have an oxygen partial pressure anywhere greater than 60mmHg. This is a huge range of oxygen pressures to maintain normal saturation. Once you dip below 90% oxygen saturation, however, this curve drops off… fast. Whereas it took 60+ mmHg to drop from 100% to 90%, it only takes ~16 mmHg to drop from 90% to 80%. From 80% to 70% it takes a drop of less than 10mmHg. In other words, the lower the oxygen saturation, the faster it drops. You can remember the rough conversion with the 30-60-90 rule. 30mmHg of oxygen is roughly 60% saturation. 60mmHg of oxygen is roughly 90% saturation. After considering our example of a normal person, let’s consider someone with severe COPD, who has a higher-than-normal amount of carbon dioxide in their blood, owing to their chronically impaired ventilation. These individuals have compensated for this longstanding ventilation problem, and thus can ‘live’ with much higher levels of carbon dioxide in their blood. Let’s estimate a patient who chronically ‘lives’ with carbon dioxide levels at 55mmHg (high, for you and I). This correlates to roughly 95-96% SPO2. That means that we have dropped our oxygen saturation without even changing the levels of oxygen present! Now let’s consider someone with COPD who is having an acute exacerbation and retaining more than usual (carbon dioxide level at 75mmHg). This correlates to an oxygen saturation of ~85%! In other words, a low oxygen saturation might be due to low oxygen, but it might also be due to high carbon dioxide. As a rule, when breathing normal room air, it is impossible for SPO2 not to drop when carbon dioxide is elevated. Finally, let’s consider what happens when we give our patient 100% oxygen. No surprise there… If the only problem present is high levels of carbon dioxide, then increasing the amount of oxygen delivered will flush the nitrogen and carbon dioxide out of the lungs (assuming there isn’t also an issue with oxygen transfer, which there might be), and increase the partial pressure of oxygen available. This will overwhelm the increased contribution of high carbon dioxide to the atmosphere of the lung. Did we fix the problem? But we made the numbers look better, so we gave ourselves a pat on the back. In fact, the reason our patient was obtunded was not because of an oxygen problem, but because of a carbon dioxide problem. Providing more oxygen has not necessarily helped the patient remove carbon dioxide. So how do we fix the carbon dioxide problem? Well, if carbon dioxide is removed from the body by ventilation, the natural plan should be to improve the patient’s ventilation. Ventilation is a mechanical process, not to be confused with oxygenation (which refers to diffusion of gasses). To improve ventilation, we need to increase the amount of air that moves in and out of the lungs. Think CPAP, BiPap, and mechanical ventilation. Non-invasive positive pressure ventilation, like CPAP and BiPap, increase the ability of carbon dioxide to exit the lungs by stenting open the alveoli and flushing air through them. BiPap and mechanical ventilation are almost certainly better than CPAP alone, because in addition to stenting the alveoli open with PEEP, they offer bi-level pressures which allow air to move directionally. Remember, CPAP increases functional residual capacity, but doesn’t directly change tidal volume (so it doesn’t affect ventilation nearly as much as BiPap). BiPap, however, is more expensive (and may not be available for your agency). Mechanical ventilation following intubation is invasive and more prone to complication, which is the very reason why non-invasive ventilation should be tried first. Just remember not to strap a high-pressure mask onto the face of your patient if they are so obtunded that they can’t protect their airway. If you flush a mouth full of vomit down into their lungs, it’s going to be a bad day for everyone. So there you have it. Is a low oxygen saturation an oxygen problem? Maybe. Maybe not. But if you have a strong suspicion that the patient is hypercapnic, you might want to reconsider reaching for the non-rebreather, and instead focus on improving ventilation. Michael Spigner is a resident physician in the Emergency Department at the University of Cincinnati (USA). He currently serves multiple prehospital roles, including Team Physician for Cincinnati Police Department SWAT, Flight Physician for UC AirCare, and Assistant Medical Director for Reading Fire Department and Evandale Fire Department. He is a former Ambulance Unit President of the Manhasset-Lakeville Fire Department (NY), where he served as a firefighter, EMT-Critical Care, and member of the Technical Rescue Team for seven years. He has also held national leadership positions with the Emergency Medicine Residents’ Association, including as the Chair of Prehospital and Disaster Medicine. He is a former Assistant Medical Director of the Colerain Township Fire Department (OH). He has a vested interest in promoting evidence-based medicine in the prehospital environment, and empowering prehospital providers to advance their field through critical thinking and personal accountability.